Even though parents and students have 24/7 access to grades, missing assignments etc. the two 7th grade teams in our building generate paper progress reports. It’s our way of making sure both kids and families are informed. We can’t rely on Eschool as the only form of communication because for whatever reason some kids or parents don’t check it. So twice a quarter–at the 4th and 8th week, students are required to check Home Access, write down the percentage and letter grade for each of the core subjects, note the number of missing assignments and obtain a parent signature. Our team has done some soul searching of late, and we came to the conclusion the kids were treating the progress report task as just another assignment to be checked off. We never bothered to ask students to reflect on student skills and learning. You see we have several students with weak student skills, some with strong student skills, and some are somewhere in between. It can be a cause for celebration, or a cause for concern. In any case it is something that parents and students should discuss. So for the past three weeks our team meetings have focused on what a new progress report should include. We now have something much more reflective. One of my teammates, who prefers to leave no trace of a digital footprint, designed the new progress report. We’ve increased the number of reports from two to three for the fourth quarter. 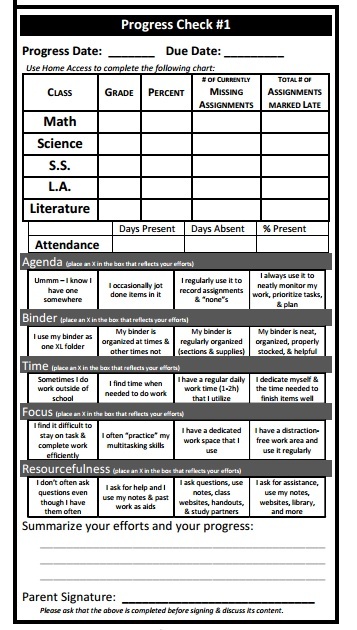 The front side of the tri-fold will capture student reflections and the reverse side will be used for students to graph the academic progress for each of their core subjects. In a future post I’ll describe the after school intervention program our team is launching at the start of the fourth quarter. Next postCan best practice result in malpractice? I teach developmental math at a small community college. Many of my students simply do not know how to take ownership of their own learning. I have been printing out their grades and writing them personalized letters to get their attention as to what they need to do to be successful in my class. I went from 5 passing out of 22 to 5 failing. However, I think that I have missed an opportunity to have them reflect on their own learning. I am going to use your posted Progress Check as a guide to create something similar for my developmental students. Thank you for this post. When students see we’re doing everything for them I wonder if they start thinking, “Why should I bother to check when someone else is doing it for me?” It’s the proverbial teach them to fish. This week before spring break I’ve also found myself printing out grades for missing assignments. What I should have done is carve a few minutes out of class time and have the students do it themselves. After all this is their learning we’re talking about. Your students are lucky to have you. They recognize you care and the personal touch is proof. I agree with both of you about the “teach a fish” comment. I deal with students who do not know how to navigate the world of college and part of my job, I feel, is to teach them where to find the information they need. Therefore, part of the conversations that occur when I pass out the those reports include where to find the information for themselves. After those first two times of my showing them what they have missing, the responsibility falls back to them. I will tell you that those personal letters had an impact. I went from 5 students passing out of 22 to 3 students within 1-4 points of passing and they are working like crazy to pass. I absolutely agree with your observation in the 1st paragraph of your comment to Alisa Carter, and I love the format of the progress report. I send a weekly report from my computerized grade book that includes the information you have at the top. I frequently have my students review their grades and comments and set a personal goal. They write this goal in their agenda book at the top of the next week. Although I’ve felt this is a useful activity, something has been missing. Your team has targeted the missing pieces in the “student responsibilities” and summary & progress sections. I think that if I add this to what I have started and make it a regularly-scheduled activity, the students will be empowered.